Found 6 file extension associations related to ZX-Editor and 4 file formats developed specifically for use with ZX-Editor. ZX-Editor is a text editor for ZX-Spectrum emulator files, which supports (nearly all) functions you know from other text editors, and also Spectrum-related things like color attributes, flashing, screen$-files etc. You also can change the text style (italic, bold etc.) as well as text height. But also 8x8-pixels fonts are supported. You also can write Sinclair Spectrum Basic and Beta Basic programs with ZX-Editor. It supports a full syntax checking and keyword handling routines. 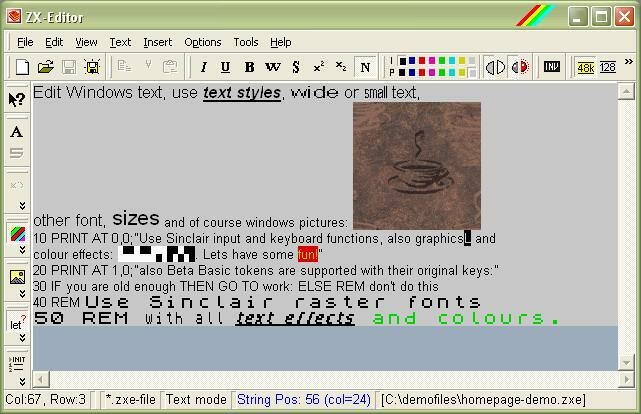 ZX-Editor is a useful tool for the ZX-Modules project, which consists of many individual and helpful programs. If you need more information please contact the developers of ZX-Editor (ZX-Modules), or check out their product website.